Contrary to popular belief professional tennis players suffers from many of the same mental struggles as the regular club or recreational player. Mental toughness is arguably the most important skill set required in order to fulfill your potential and so being aware of some simple yet highly effective ‘tricks of the trade’ will provide you with an unshakeable confidence and perhaps even more importantly, a plan of action when in the heat of battle. 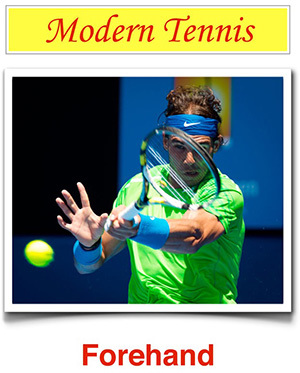 Modern day tennis has become a complex conundrum involving an expansive range of factors for players to comprehend and master including movement patterns, strategical awareness, statistical tendencies and biomechanical recommendations. The spectacular shots we see from the professional players are undoubtedly awe inspiring but it is ultimately their mastery of the basic principles of the game that separates them from the ‘average Joe’. With so much information readily available through modern technology and coaching, it can often be easy to forget the fundamentals and mistakenly evaluate the game with a ‘top down’ approach. When experiencing difficult periods during a match focusing on simple concepts such as a ‘low to high’ swing or the ‘bounce-hit’ of the ball will elicit a clear thought process devoid of unnecessary distractions. After all tennis is simply a matter of putting the ball over the net and in the court one more time that your opponent. Nothing more. Nothing less. Tennis is unique in comparison with other sports in so much as it is a predominantly internal battle rather than an external one. Statistics from the professional tour indicating the average number of unforced errors to winners highlights how so much of what ‘we do’ rather than what the opponent ‘does to us’ effects the outcome of a match and so understanding the importance of being your ‘own coach’ on the match court is of paramount importance. Setting performance based goals during a match such as ’I want to hit spin on both my 1st and 2nd serve’ rather than result based ones ‘I have to make over 70% of my first serves’ allows you to remain objective in your analysis while providing the added benefit of alleviating scoreboard pressure. Former ATP player Brad Gilbert summed up tennis with one very simple concept “you have to figure out who is doing what to whom” and so paying attention to the journey rather than the destination will provide significant benefits.